Everyone who watches American Horror Story is struck by a different character. Some people are drawn to the fashionable yet fierce countess. Others are haunted by the images of the Infanta when they think back the Murder House season. But we all know who is the king of creep, the Duke of dread, the Regent of revulsion. He's a man of few words but that's the reason he sparks our nerves so effectively. With a deathly stare, a disheveled demeanor, and an unsettling desire to entertain, this fella stands out in horror history. With a character like this, you'll not only have tickets to the horror show, you'll be the horror show! You don't have to go through Twisty's dramatic backstory to become as spooky as the AHS legendary clown. The featured top has a gnarly dirty pattern, ruffles along the shoulders and sleeves, and "cheerful" puffs up the front. 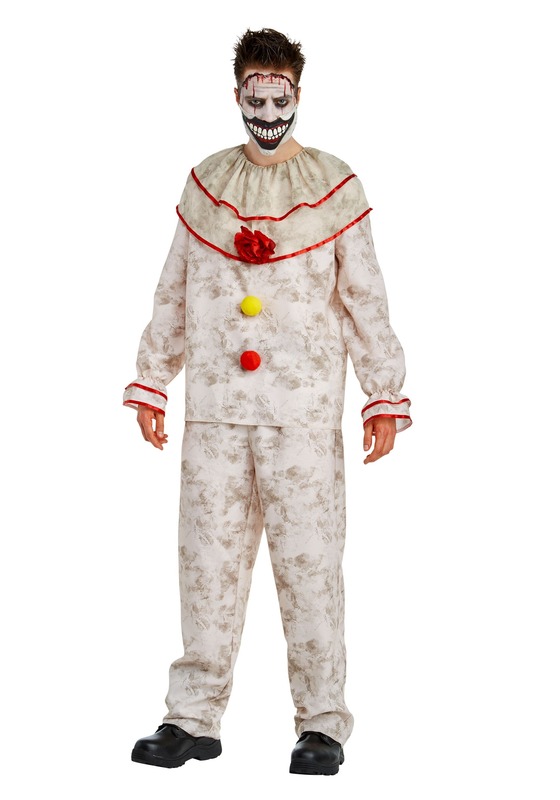 It's paired with matching pants and a molded latex face mask that covers the bottom half of your face so that you'll be ready to perform as soon as you hit the streets. You don't have to say anything to make all the Halloween revelers around you remember your act. Just don't forget to paint the rest of your face and bring along a bag of tricks. After all, everyone needs to know you're a good clown. Perform your tricks right and you'll feel like a creepy star. Don't want to perform alone? Pair up with the rest of the American Horror Story family. With the Rubber Man, The Countess, and the White Nun there are plenty of characters to choose from for your whole crew. Because when it comes to celebrating the horrors of this series, you'd better do it right!